quadratic equation, and extracting square roots. • Factoring: This method can be used whenever the polynomial is factorable. It is based on the idea that if ab = 0 then either a = 0 or b = 0.
tion. There should just be a zero left on the other side of the equation. 2. Factor the polynomial completely. 3. Rewrite the equation as two equations, setting each factor equal to zero. 4. Sove both of the resulting equations. 5. Check the answers in the original equation. Example 1 Solve x2 + 6 = 5x by factoring. x - 2 = 0. 4. Solving these two equations, we have: x = 3 and x = 2. So, the solutions to the equation x2 + 6 = 5x are x = 3 and x = 2. 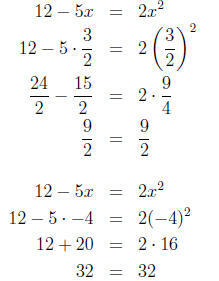 Example 2 Solve 12 - 5x = 2x2 by factoring. x + 4 = 0. 4. 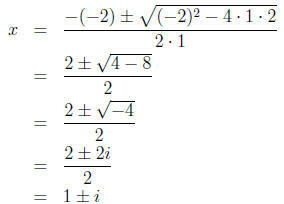 Solving these two equations, we have: x = 3/2 and x = -4. So, the solutions to the equation 12 - 5x = 2x2 are x = 3/2 and x = -4.
is not always the simplest method, but it will always work. 2. The equation is in general form: ax2 + bx + c = 0. Identify a, b, and c.
4. Simplify to find x. Example 3 Solve x2 + 6 = 5x by using the quadratic formula. 2. a = 1, b = -5, and c = 6. Example 4 Solve 2x = x2 + 2 by using the quadratic formula. 2. a = 1, b = -2, and c = 2. So, x = 1 + i and x = 1 - i. 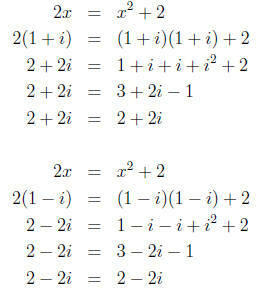 So, the solutions to the equation 2x = x2 + 2 are x = 1 + i and x = 1 - i. 3. Get the variable by itself. 4. Check the answers in the original equation. Example 5 Solve (2x + 1)2 - 9 = 0. 2. Taking the square root of both sides, the equation becomes: 2x + 1 = ±3. 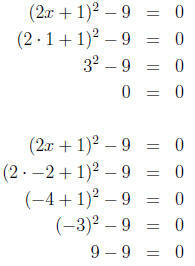 So, the solutions to the equation (2x + 1)2 - 9 = 0 are x = 1 and x = -2.